Can Writing About Food Spread Understanding of Deaf Culture? Anna: These days, everyone is obsessed with food, posting photos of practically every meal they eat, cook or fantasize about on Instagram, Facebook and Twitter. Besides being an interpreter, I am a freelance writer and focus my magazine articles on the intersection of food and culture in order to increase Americans’ sensitivity to people from various cultures. I trust that the subject of food is so fascinating that while readers learn about “exotic” dishes from around the world, they may unconsciously absorb some cultural knowledge as well. But could this strategy work to sensitize Americans to the elements of Deaf culture as well? I think it definitely can. Although Tom and I have written books and produced videos to educate people about the features of Deaf culture, our consumers are usually ASL students or interpreters and not members of the wider public. So whenever I have the chance to write a food article and give some exposure to a Deaf chef or restaurant owner, I consciously include some relevant details that I hope will reveal aspects of Deaf culture to the general public. My initial chance to do so was when I profiled my friend Betty Ann Prinz, the first self-identified “foodie” in our local Deaf Community. Besides teaching ASL, she cooked, catered, taught wine classes and became a trusted authority whom other Deaf people could go to with food-related questions. After recounting her life journey for my article, Betty Ann added some tips about which are the best seats for Deaf restaurant patrons (depending on the shape of the table, lighting and a non-distracting location). I am sure many hearing readers never considered this before. In another article, I wrote about a local food tour in ASL for the many Deaf Bay Area food lovers who aren’t chefs themselves, just regular people (software developers, college professors, actors and retired folk) who are obsessed with trying out new places and learning about the food history of Berkeley’s “Gourmet Ghetto.” As the tour leader, I knew I would be breaking a rule of politeness in Deaf culture. Due to our tightly planned schedule tasting tidbits at nine places in three hours, I was going to have to rush the group from one spot to another. In Deaf Culture, I wrote, (despite the advances of email, video phones and texting), face-to-face communication in expressive ASL often has top priority and thus it is considered rude to interrupt signed conversations. My most recent article to pair food and Deaf culture came about when a mutual friend, –who knew we were both food-obsessed — introduced me to Vernon McNece. Vernon had just moved back to California to become an instructor in the F.E.A.S.T. (Food Education and Service Training) program at the California School for the Deaf – Fremont. It just happened that the day I visited Vernon’s classroom with a photographer, he and his students were preparing for the 8th Annual Deaf Culinary Bowl. That subject gave me a chance to describe the long tradition of diverse competitions in the Deaf community, such as the National Deaf Academic Bowl, the Deaflympics and even school football games and neighborhood bowling leagues. Vernon also shared his story of working in a Food Lab, but as the only Deaf employee. It was a frustrating experience for him, because although he had exceptional talent in creating formulas in record time, his hearing co-workers couldn’t even tell him how well he was doing. When I turned in my article to the editor of Edible East Bay magazine, she expressed her appreciation of learning so many new facts about Deaf culture and her certainty that her readers would be equally enlightened. So if any of you are experts in something, pick your topic: be it sports, dance, art, cars, business and find a Deaf angle to write about. You may be doing a service by educating a new community of readers. Posted in Deaf Culture, Deaf Culture in Action, Deaf Culture Values, Deaf owned business, Deaf owned restaurant, deaf-owned business, Deaf/hearing cultural differences and tagged Betty Ann Prinz, CSD Fremont, Deaf Culture, Deaf Foodies, food and culture, Mozzeria, Vernon McNece. Bookmark the permalink. 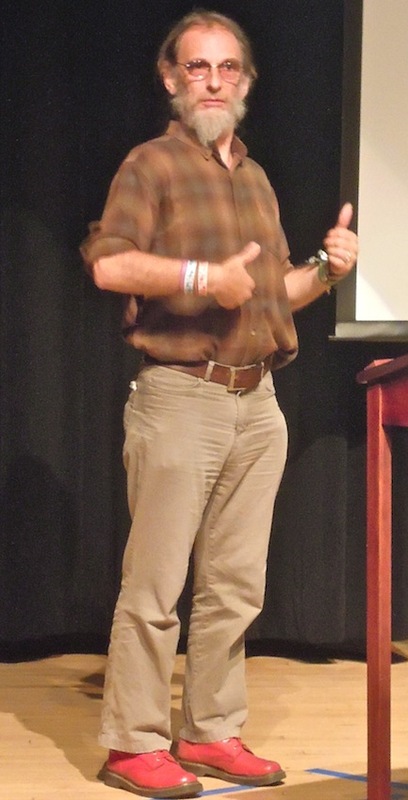 Last week, I joined the warm crowd who welcomed Dr. Paddy Ladd at the California School for the Deaf in Fremont, California, where he treated us to a sneak preview of his new book that challenges the prevailing methods in Deaf Education, which have been invented and promoted by hearing people. His presentation, co-sponsored by CSD and the Deafhood Foundation, A Final Frontier: Can Deafhood Pedagogies Revolutionize Deaf Education? was live-streamed by the Deafhood Foundation, which promises to make the video available at a later date, but Dr. Ladd’s Power Point slides can be found on their website now. SEEING THROUGH NEW EYES: Deaf Pedagogies and the Unrecognized Curriculum. Now that his Department of Deaf Studies at the University of Bristol is closed despite a public campaign to save it, Ladd cited the upside of having more time to write and finish this book. The anticipation is high for Ladd’s new book after the huge impact his first book Understanding Deaf Culture:In Search of Deafhood has made around the world. Deaf Way II panel, with L to R: Thomas Holcomb, Theresa Smith, Anna Mindess, Ben Bahan, Paddy Ladd. A personal note: I first met Paddy Ladd in 2000 in Amsterdam at the TISLR conference (Theoretical Issues in Sign Language Research) where we both presented. My book had just come out and he was still working on his. We connected against the backdrop of extremely theoretical papers because both of us hoped that our work would result in practical changes. 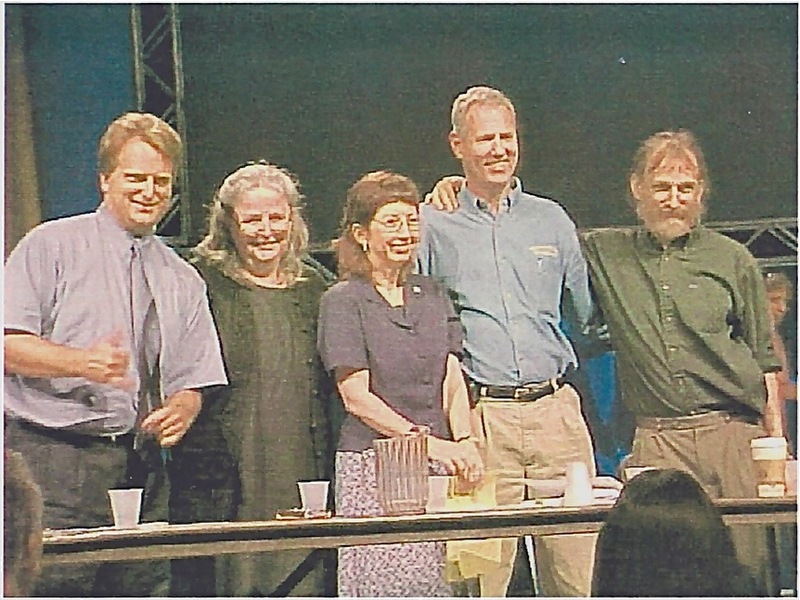 Then in 2002, at Deaf Way II, Tom and I were honored to be invited by Paddy to join him in a panel he chaired called Researching Deaf Culture, Liberating Deaf Community (with Ben Bahan and Theresa Smith). Here is a very old picture of us all. Please be advised that Paddy signs in BSL (the rest of us in ASL). The video includes voice interpretation, but no captions. Posted in ASL/English Bilingual education, Deaf Education, Deaf leaders, Deaf people around the world and tagged California School for the Deaf, CSD Fremont, Deaf children, Deaf Education, Deafhood Foundation, Dr. Paddy Ladd, Paddy Ladd, Seeing Through New Eyes, Understanding Deaf Culture. Bookmark the permalink.